For day two of Michael Miller's twelve d.i.y. 's of Christmas, we Mod Podged some cute letter ornaments-- it's so easy and perfect for a co-worker or a friend! 1. You'll need some wooden (or paper mache) letters-- we found ours at Michaels but you can also find unfinished wooden letters at your local craft shop or at Joann's. If you'd prefer paper mache, Land of Nod has some cute letters: just click here. 2. Pick a festive fabric. We used Tiny Houndstooth in rouge and Pinhead in Spearmint. Check out our holiday collection and you'll be sure to find something special! 3. 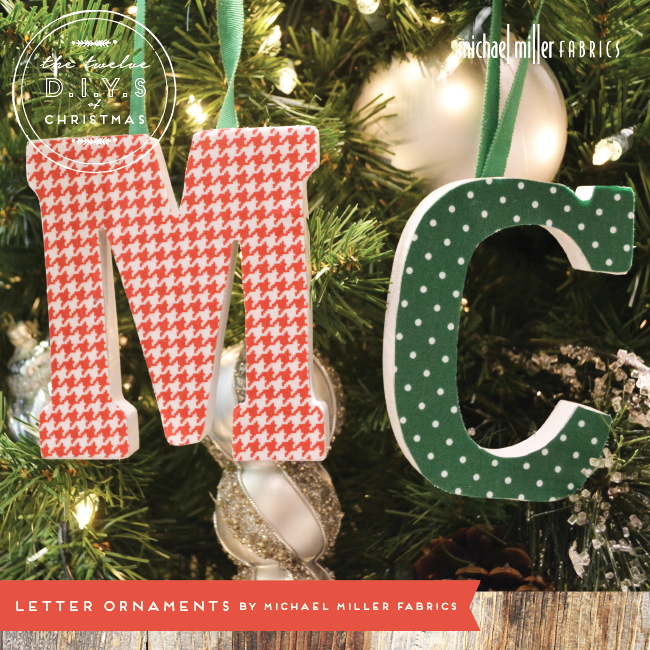 I've found that the Mod Podge Rocks Blog has simple, easy-to-follow instructions for the technique... so just follow along and create your letter ornament! IMPORTANT NOTE *Trace your wooden letter on the wrong side of the fabric, making sure that it'll face the correct direction when placed on the letter (this means that you'll trace the letter backwards). Be sure to share your finished projects- we love to see!